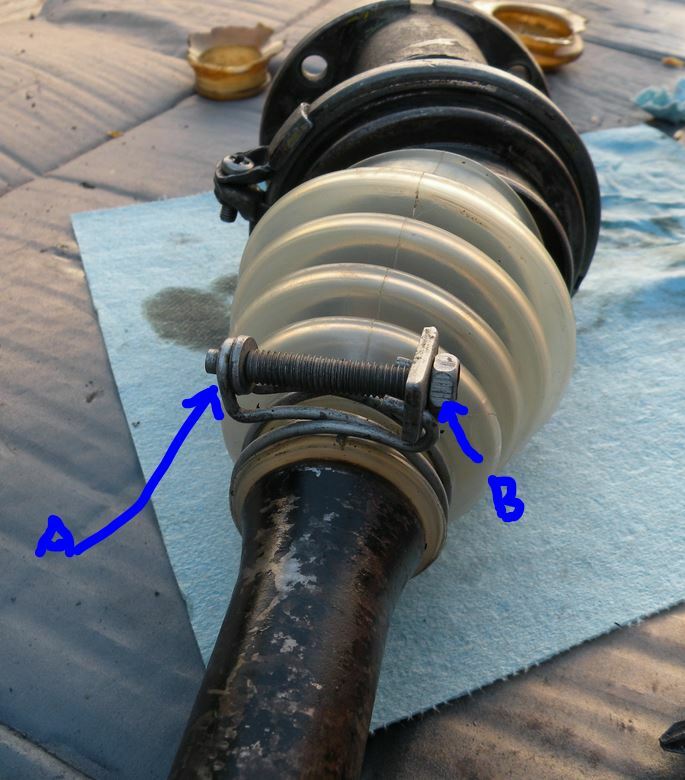 Here is a Word Doc with a description and pictures on how to replace the boots on the early long neck diff half shafts. This is an excellent write-up, and everything worked as advertised - however, not enough stress is placed imo on exactly how impossible getting the boot over seems at the beginning. I was on the verge of giving up on the whole idea and go find a hydraulic press. The key point is lubrication, and stretching the boot. 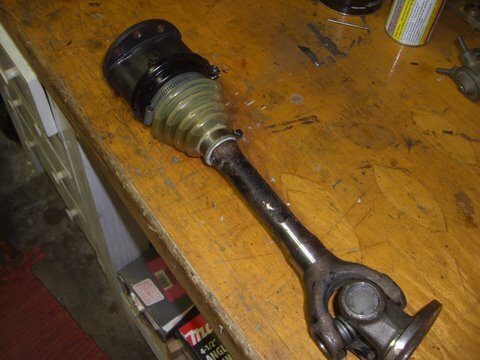 You have to find an equilibrium between not enough gear oil on the shaft, and gear oil over all your tools and hands, which makes it pretty much impossible to use any kind of force. For stretching, I used a small crowbar that I have, and levered against the end of the half shaft to stretch it. You should get it to a point where the boot slides easily over the first end of the pin and the "ball" at the end of the shaft, then just starts riding up the second half of the pin. Two rings of the bellows need to be past the end of the first pin for this to work. This is the point when you put the spoon handle under (there should be small gaps on either side of the second pin that are perfect for working a spoon handle under). Chances are the boot will keep sliding off, and that you will have to go and reheat the boot (perhaps several times), but at some point when the stars are right you will be able to lever the edge of the boot with the spoon handle at the end of the pin until the spoon is flat against the end of the pin, and at this point the boot will simply slip over. The spoon needs to be on the outside of the boot for this, but you can use it from the inside also to stretch the boot further if it doesn't seem to be sufficiently stretched. The whole operation demands really considerable force, and you will have been thinking about three times "if I pull a bit harder now, the boot is going to tear" - but for me, it hasn't. Caution: the spoon is a disposable item - do not use one you still want to use or SWMBO is attached to. The ends of the pin are sharp and hard steel. The spoon will be not only be bent, but also gauged badly. Do not try to use a flimsy spoon that bends easily, or a spoon that is too small - you need the leverage! Thanks for the advice Chris ! Cris, Glad my write-up helped. I did not have a problem fitting it over the first pin and the edges of the pin shouldn't be sharp. Getting the boot hot enough to stretch is the key, and, I only used the handle end of the spoon held inside the boot to lift it over the second pin. Literally it took one minute after I got over the fear of tearing the boot. It just opened for me. Paper Clip icon on right side of page. Yes, thanks for this info! I got on here to figure out how to remove the pin, so it was nice to discover that it could be done without removing the pin. I would never have guessed that it would be possible. The instructions and pictures were very helpful. I heated the boot in water and was able to get it over the first pin and ball, but the boot had cooled by the time I got to this point. So I took my wife's blow dryer to it to heat it up again to get it over the second pin. And yes, I really had to put some force into it to get it over the second pin. I pried with a spoon, and pushed from the inside with the round end of a long wrench at the same time, which really helped. Ken, you have to be logged in to the forum in order to see the attachment and pictures. I didn't see them either until I logged in. I forgot to ask a question. When I reassemble the sliding joint, do I use any grease to pack the joint, or do I just put in the gear oil after I have everything assembled? I'm trying to do all of this without removing the half shaft, so the joint is currently vertical and I'm not sure how to keep all of the needle pins in place on the bottom pin without using a little grease. Use grease to hold needles in place but I can't imagine attempting this in place, much easier to remove. Then just fill with oil. Just used the instructions and in less than 1 hour it was done! I was very hesitant to try this but after a beer, dinner and a glass of wine, I was ready. Old clamps came off in 2 minutes. Cut the old rotten boot off. I carefully removed one of the end "caps" and saw all the needle bearings. Didn't have the grease handy and sure enough, 3 or 4 tipped over. Tried to get them back in but it was useless. I dumped them out and thought, "where am I going to buy another axle?". I then slid the round part over the end pin and carefully just inserted the 29 pins. Put the end cap in and it was all good. I boiled the boot and tried putting in on over the "pin end with ball and needles". Either this is wrong or the boot wasn't hot/pliable enough. I didn't think this was going to work. I carefully removed both caps and pins and laid them on their backs, all pins standing vertical. I replaced the bent spoon in the drawer and grabbed the metal meat fork which had a thicker handle. Heated the boot some more and in less than 30 seconds I had it on. I simply reached through the boot with concave part of handle down on top of the far pin and just pried the boot up and over. Yes, I thought I was about to waste $30 but it went over. Great write up. I'll be doing this soon enough. Where can I buy these early style boots? I've only seen the black ones, not the clear kind. You can get them from BluntTech. Steve, the owner, is wonderful and he has them in stock. I just ordered EVERYTHING for a complete suspension overhaul/upgrade and he was great! You can contact him at sales@blunttech.com. Thanks so much for the quick response! I'll drop him a line.